The Burnley club were proud to be representing our country in this prestigious tournament and were set to be kitted out in a new style claret and blue strip that had been presented to them by a Manchester firm. 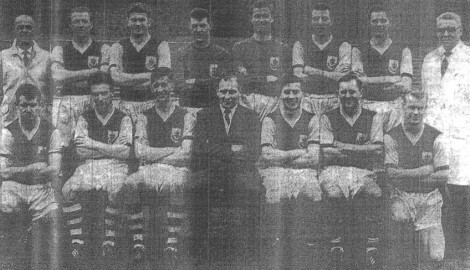 The club were taking 16 players to New York and twelve of them were present at Turf Moor for the official photograph two days earlier in their new kit - as shown above. Absentees were John Angus and Ray Pointer, who had been allowed home to the north-east and were preparing for the England Under-23 tour, and Alex Elder who had been home to Northern Ireland. Also missing was John Connelly as he continued to recover from his cartilage operation. Angus, Pointer and Brian Miller were not with the players when they set sail. They were on their way to Berlin, Warsaw and Tel Aviv with the England Under-23 team and would return to London before flying to New York to join their Burnley colleagues. Ahead of the journey Mr Harry Potts, the Burnley manager, announced the club's retained list. Fifty years ago, a player retained was just that and was not free to go and find another club. Of the players at the club, both wing-half William Cockburn and inside-forward Ivor McAuley were released. Neither Cockburn nor McAuley had progressed beyond the reserve team. Mr Potts confirmed that all of the remaining 42 players had been retained. Back Row (left to right): Ray Bennion (trainer), Tommy Cummings, Brian Miller, Adam Blacklaw, Jim Furnell, John Talbut, Jimmy Robson, Billy Dougall (physiotherapist)Front Row (left to right): Walter Joyce, Trevor Meredith, Jimmy Adamson, Mr Harry Potts (manager), Jimmy McIlroy, Brian Pilkington, Gordon Harris.